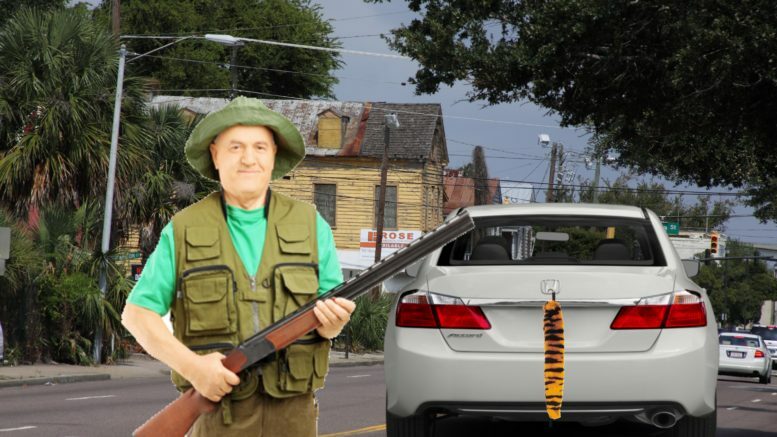 A trophy hunter is receiving a barrage of criticism on social media today after it was discovered he shot and killed a Honda Accord with a Clemson Tiger tail hanging out of the trunk. Dr. William Slater traveled to Charleston, South Carolina with the intention of killing a Bengal Tiger, but mistakenly shot the four-door sedan instead. Dr. Slater enlisted the help of a hunting guide on Craigslist and paid him $50,000 to bring him to a Bengal Tiger in Charleston. The hunting tour guide, known as “Tricky Ricky”, led him to Rivers Avenue and both hid off to the side of the road. As soon Dr. Slater saw a tiger tail, he fired one shot directly into the car’s engine, rendering it lifeless. After the kill shot, he posted a photo of himself and the deceased car on Facebook, igniting a firestorm of criticism. That’s when he realized he had shot someone’s car and not a real tiger. Dr. Slater has since closed his successful dermatology practice indefinitely and is hiding in his mountain cabin, where he’ll probably try to kill other animals. The Clemson game this Saturday will begin with a moment of silence for Danielle’s slain Honda Accord. 2 Comments on "Trophy Hunter Under Fire For Killing Sedan With Clemson Tiger Tail"
Could have shot a Jaguar. Funny stuff. Nice photo: “Redd Greene” retires in downtown Charleston, just up the street from Bill Murray’s property.